This is one of my favorite kung fu movies and definately one of the bloodiest. I'm still pretty amazed that this splatterific pic was shown almost uncut on Sunday afternoon UHF T.V. back in the '80s. The story; a 'good' martial arts clan is challenged by a 'bad' martial arts clan. The stakes? If the bad clan loses, they must be forever banished (from where and to where exactly, I'm not sure) but if they win, they will rule the martial world (and presumably throw everything into chaos). The good clan wins, but are then challenged by the mysterious Japanese Ninja clan hired by the bad sect. Unaware of exactly what a ninja is, the top fighters accept the challenge and meet at five designated areas, where they are wiped out by the tricks and secret weapons of the ninja, who utilize the five elements; the 'Gold' ninja use reflective shields to blind their opponents, the 'Wood' ninja use trees as camouflage, the 'Water' ninja erupt from a river, the "Fire' ninja blind their opponents with smoke before incinerating them and the 'Earth' ninja burrow underground. With most of their best fighters dead and their master posioned through treachery, the 'good' clan reinforce their base in anticpation of an attack. However, they are infiltrated by a Mata Hari like female Ninja who poses as an abused orphan (this plot device should have fooled no one, yet amazingly fools everyone causing me to remember the line in Spaceballs, "Now you see that evil will always triumph because good is dumb"). Through her, the ninja clan recieve a detailed map of the base and promptly attack it, massacuring evryone inside. Only one member manages to escape as through flashbacks, we see that he learned a few ninja tricks of his own from a hermit like old master. Returning to see him, he is now taught (along with the old hermit's three other pupils) the secrets of ninjutsu. Now prepared and fully armed (metal battle axes that are filled to the hilt with secret gadgets), our four heroes challenge the five element ninja clan at the same five designated spots. One by one (element, that is), our heroes annihilate the entire clan. Director Chang Cheh was known as 'The Godfather of Hong Kong Cinema'. From the mid '60s through the mid '80s, he directed more than 100 films. From the early wuxia (swordplay) style epics to the revolutionary 'empty hand' fight fests to wild fantasy actioners, Chang was always leading the way in innovation for the mighty Shaw Brothers studio. Five Element Ninja was his last for the Shaws and to say he went out with a bang would be a supreme understatement. 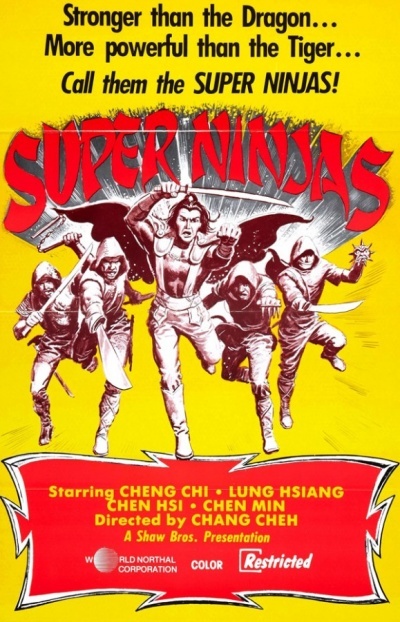 Always known for extreme (if cartoonish) bloodletting, Chang would pull out all the stops for this, his wildest, bloodiest and most action packed film ever. The level of over the top gore on display here is simply astonishing. Examples; during the initial contest, the Earth ninja continuously stab at a fighter from underneath with spears... getting the poor schmuck between the legs! The brave warrior continues on despite his entrails dangling to the ground! He ultimately is defeated when he accidentally steps on said entrails while attempting to charge, freezing him where he stood (understandably). During the climatic battle, we see various ninja having their arms and legs cleanly torn off by our heroic quartet. The leader is finally dispatched by being slowly ripped in half! It is all shown in bold, comic book like style. The result of the nearly constant (and consistently creative) action makes for a giddy, superheroic experience. An extremely colorful (and pleasingly color coordinated as the ninja outfits matched the respective elements they represented) late period Shaw epic, Five Element Ninja adds up to wonderfully crazed eye candy for the kung fu lover. It is a favorite among many enthusists who simply can't get enough of this supreme example of go for broke filmmaking. For me, it's easily one of my Top 10 old schoolers and I've lost count of the number of times I must have watched it over the decades. Lego Minifigs Series 8 Images Disappoint? America's Got Talent Quarterfinal Recaps: WTF?